Why on earth would anyone outside the wingnut welfare state hire a disgraced right-wing asshat like Ben Domenech? The White House ripped CBS News on Thursday for publishing an online column by a blogger who made assertions about the sexual orientation of Solicitor General Elena Kagan, widely viewed as a leading candidate for the Supreme Court. Ben Domenech, a former Bush administration aide and Republican Senate staffer, wrote that President Obama would “please” much of his base by picking the “first openly gay justice.” An administration official, who asked not to be identified discussing personal matters, said Kagan is not a lesbian. The network deleted the posting Thursday night after Domenech said he was merely repeating a rumor. So… Kagan is rumored to be openly gay? Oh, and thank you so much, Jason Levin, for giving this ridiculously lame excuse credibility. 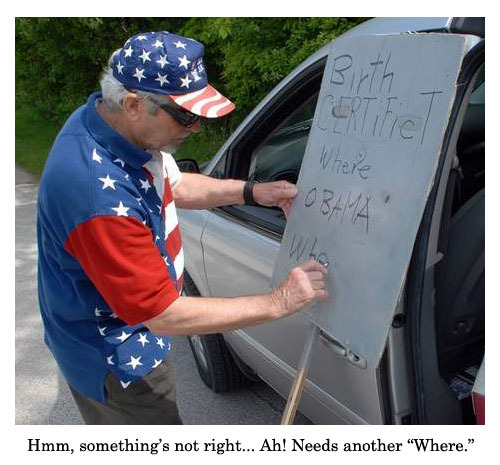 Like the teabaggers even need your help to look crazy.